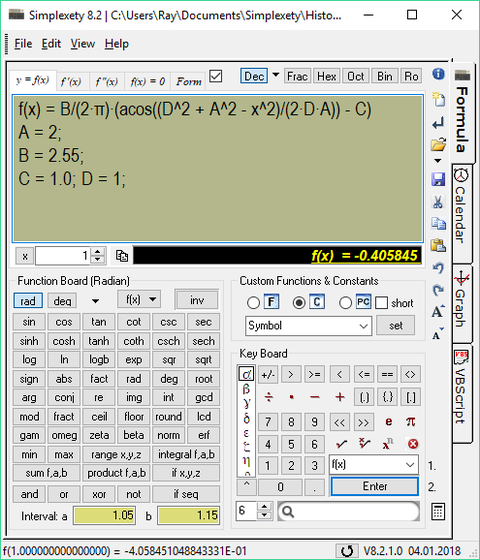 Simplexety is a comprehensive freeware software utility specifically designed to help you perform various mathematical operations. Whether you are mathematics teacher, a student or an engineer, this utility proves it's not just a simple scientific calculator. At first glance, the interface of the application may overwhelm you, because it contains numerous buttons, mathematical expressions, symbols and tabs that might get you confused, especially if you are a novice user. But once you get used to its layout, you can easily perform complex operations with just a few mouse clicks. Simplexety supports several dedicated parameters that enable you to perform various mathematical operations, such as subtraction, addition, division, multiplication, as well as trigonometric, parametric or polar functions. With Simplexety, you can calculate integrals, derivatives and numerous equations based on well-known abstarct mathematical theories that can be found in science and mathematics textbooks. Besides being able to select the formula you want to compute, you can also edit equations accourding to your needs, but keep in mind that in order to use Greek characters, you need to double-click each symbol. The generated results can be copied to the Clipboard or the entire content can be saved as a file. Other options, enable you to choose the measurement units for trigonometric functions or create custom functions and constants. 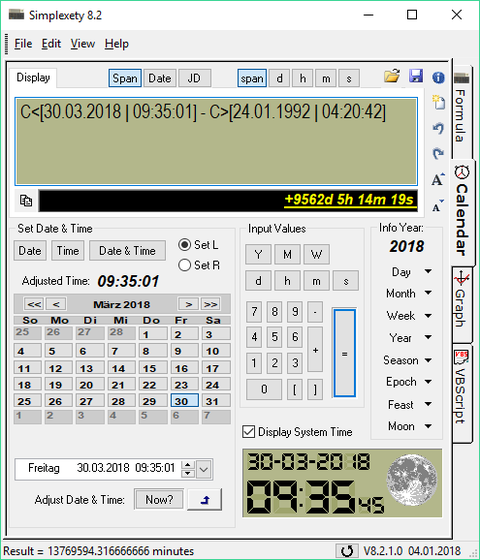 The application's built-in date and time parser allows you to perform various calculations to determine the current year, week, day, moon phase, season or epoch. Furthermore, you can use the Graph function to display each equation using the Cartesian coordinate pane. All in all, Simplexety is a sophisticated software application contrary to what its name may suggest. It enables you to compute complex mathematical equations, while allowing you to create and run VBScript codes. The calculator program Simplexety provides simple and advanced mathematical functions in a straight forward designed application. Download it for free from our download page. Simplexety is established with four comfortable Formula/Code Editors and a plotting page to plot the functions and formulas. You can edit the formulas and code, quickly and easily, either expressed in the Form or Scientific Editor. The VBScript Editor can be used to write short Visual Basic Script programs. You can transfer the formula from the Form to the Scientific Editor and via command to the VBScript Editor. If there is a fault on a formula string, then the program opens a separate window where you can see the position and the reason of the error. Download it direct here - for free!